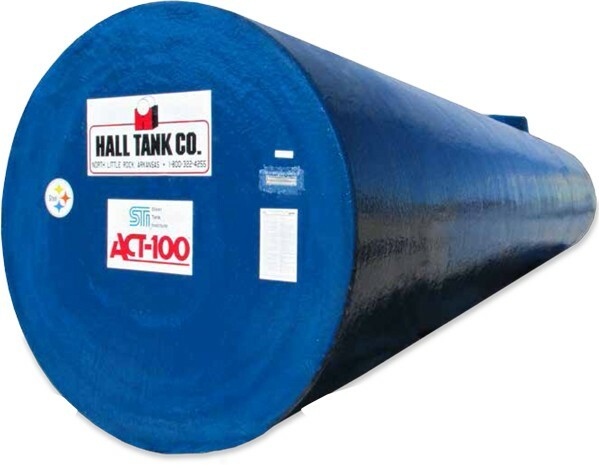 ACT-100® Steel/FRP composite tank features a strong steel tank for structural integrity, and a 100-mil fiberglass outer coating for long-lasting corrosion protection. Double-wall design allows continuous interstitial leak detection and monitoring. 1. Provide ACT-100® external corrosion protected FRP composite steel underground storage tanks. 1. Tanks shall bear the Steel Tank Institute ACT-100® label. 2. Underground tanks shall bear the appropriate Listing label. Corrosion Protection of FRP Composite Steel Underground Storage Tanks. 2. Tanks shall be manufactured and listed in accordance with Underwriters Laboratories UL 58, Steel Underground Storage Tanks for Flammable and Combustible Liquids and UL 1746, External Corrosion Protection Systems for Steel Underground Storage Tanks or ULC-S603.1, Standard for Corrosion Protection for Steel Underground Tanks for Flammable and Combustible Liquids. 3. Double-wall tanks shall provide testable secondary containment on site and access for interstitial leak detection monitoring. 4. Tanks shall have a minimum 100-mils of an approved FRP laminate on the tank exterior. 5. Tanks shall be factory tested with a high-voltage holiday test. 1. Manufacturer shall be a licensed member company of the Steel Tank Institute and subject to Steel Tank Institute’s Quality Assurance program. Copyright ©2019 Hall Tank. All Rights Reserved.